Craft has changed a lot since South Australia’s premier, Don Dunstan, proudly opened the doors to the JamFactory in the early 1970s. Having successfully ditched its folksy image, craft is frequently referred to as ‘contemporary design’ in art publications and online blogs. In New York, for instance, ceramic studios, cabinetmakers and textile designers are “hot” destinations on design tours. (1) Showcasing craft’s new slick image, Gold Coast City Gallery presents JamFactory’s 40th anniversary travelling exhibition Designing Craft/Crafting Design: 40 Years of JamFactory. 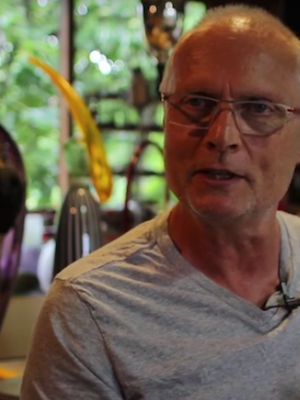 The iconic JamFactory has been recognised for many years as a vanguard of Australian craft. Its public face is a popular, upmarket retail and exhibition space in the heart of Adelaide. The creative hub, however, takes place behind the scenes in purpose-built studios for ceramics, glass, metal and furniture design. The beauty of the set-up is the teaching and sharing of techniques and skills. As glassworker Nick Mount explains, ‘If you have ten people working together for ten years then, all of a sudden, you have 100 years of experience available to you.’ (2) This 40th anniversary exhibition features new work by 40 artisans who have been significantly involved with JamFactory during their career. It’s an immense curatorial challenge to bring together a diverse range of mediums in one exhibition, but co-curators Margaret Hancock Davis, Margot Osborne and Brian Parkes use the irregular space at the Gold Coast gallery to great advantage. Recessed cubicles, staggered walls and display cabinets enable smooth transitions between mediums. They also offer intimate spaces for audiences to view individual works. A video interviewing each artist provides further information on technical processes as well as the artist’s relationship with JamFactory. 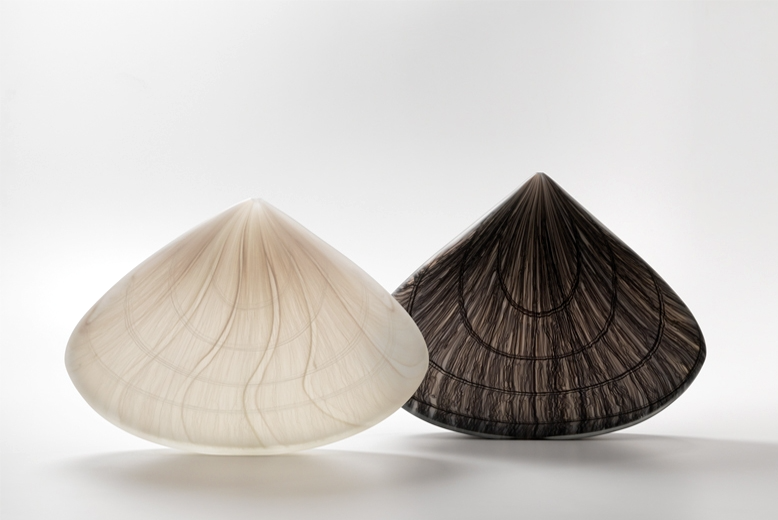 Exhibitors include some towering figures in Australian craft (think Prue Venables, Frank Bauer and Jeff Mincham), but works by less recognised glass artists’ carry as much visual punch. 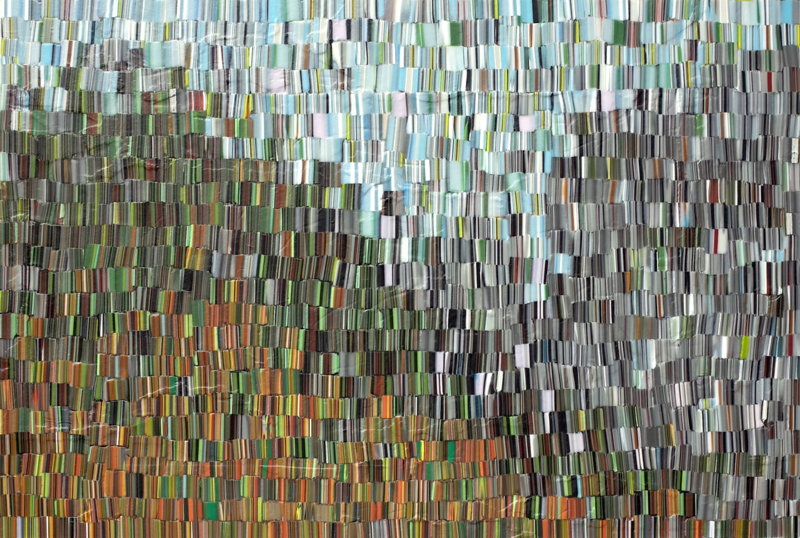 One standout piece is Brenden Scott French’s wall-panel landscape, Tectonic Trace – Binary #6. The kiln-fired work comprises nine glass panels portraying a geological profile of a semi abstract landscape. Expansive skies and low horizon lines contrast with areas of densely patterned vertical lines that suggest drill holes from mining. The work’s strength is the disturbing effect elicited from the jarring of the pristine and desolate vignettes. French’s theme is universal in concerning man’s impact on the environment. It also concerns French’s questioning on the wastefulness of his glass making process that involves multiple firings to produce the desired result. 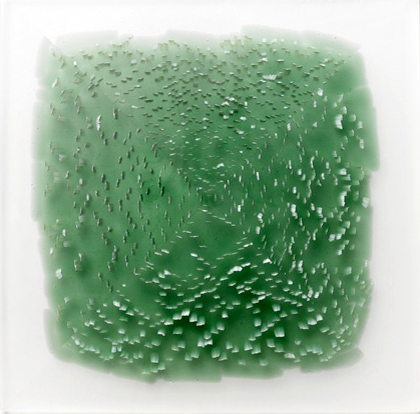 Equally absorbing is Janice Vitkovsky’s fused and carved glass monochromatic wall panel, View. 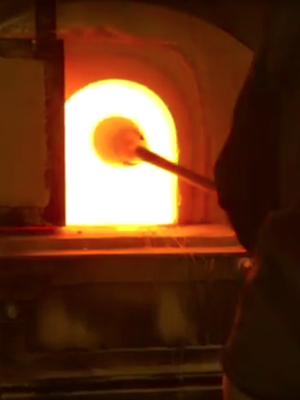 Working with sheet glass to create intricately patterned rods, Vitkovsky’s distinctive style builds on the traditional Venetian murrine technique. Here a mass of white rods forms an intricate abstract pattern against a translucent pale green background. The piece is hypnotic and visually disorienting because the rods appear to curve and swirl at different viewpoints. This moiré effect is a constant in Vitkovsky’s work and runs to the heart of her interest in motion and the perpetual. 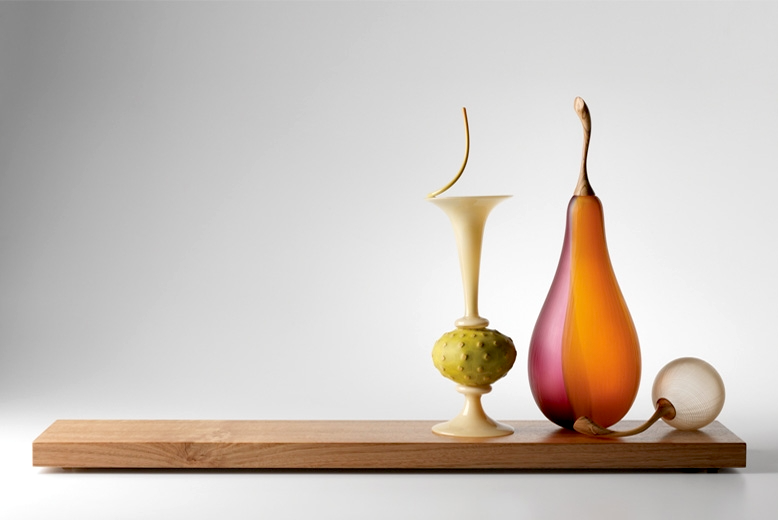 Although Nick Mount is a “living treasure” in Australia’s glass movement, Still Life with Bosc and Strange Fruit shows a recent development in his work. 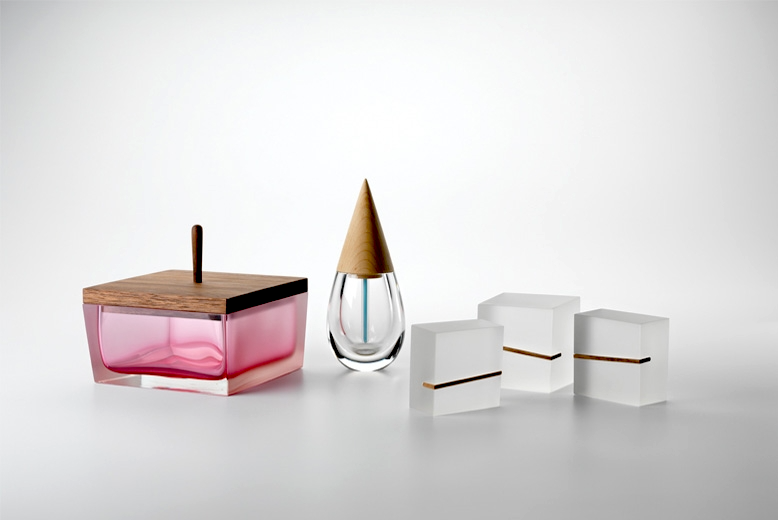 The work is a glass and wood assemblage comprising a fanciful curved vessel, a teardrop-shaped pear and a round nut. The piece references art history’s genre of 17th century Dutch still life painting, but in Mount’s assemblage there’s no sign of decay or coded moral messages. Each form is captured at the peak of its beauty – as if frozen in time. Mount’s focus is on form and the integrity of the material, and here we see his technical virtuosity in the counterbalancing of rich and delicate hues, robust and attenuated forms, and smooth and textured surfaces. The recent return of craft to the contemporary art scene is a welcome move. (3) This new turn sees artists working in process oriented art practices as a counter to the glitzy spectacle art privileged in art biennales. The foundling vision of JamFactory was concerned with nurturing creative talent to develop ‘a world-class crafts and design facility.’ (4) Through its 40-year colourful history, the institution has had plenty of detractors and endured strong criticism. Thankfully, the gritty determination of the people involved has ensured its survival. As an educative and creative institution, JamFactory stands alone in Australia’s cultural history. This travelling exhibition presents an opportunity to see the latest work by some of our leading artisans. Many exhibitors are current or past educators at JamFactory, and their work appears in national and international public collections. From the quality of the works on show through to its clever curatorship, Designing Craft/Crafting Design is testimony to JamFactory’s commitment to a standard of excellence. I look forward to celebrating its 50th milestone! 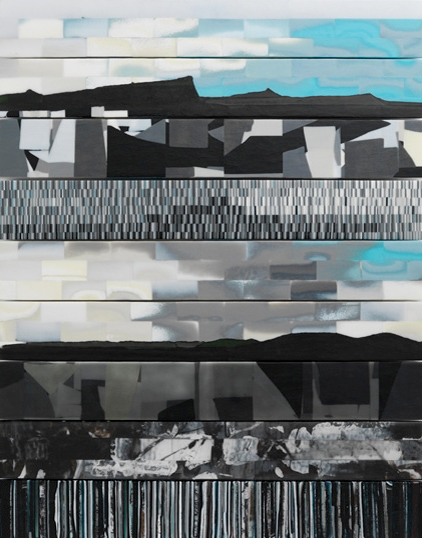 Header Image: Brenden Scott French, View from the Window, kiln formed glass – wall panel, H64.5xW93.5xD4cm, 2016, Image courtesy Sabbia Gallery. Music Courtesy: Per Olov Kindgren, Nocturne (In the Darkness of a Dream). Clare Belfrage: Art Design and Architecture as part of the touring exhibition Designing Craft/Crafting Design: 40 years of JamFactory. Nick Mount: Designing Craft/Crafting Design: 40 years of JamFactory. Peta Kruger: Designing Craft/Crafting Design: 40 years of JamFactory. 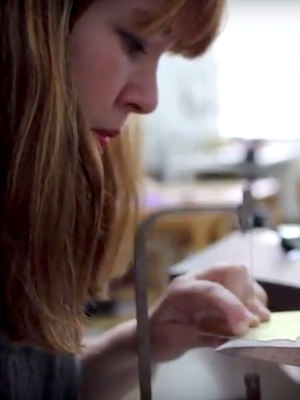 Lesa Farrant: Designing Craft/Crafting Design: 40 years of JamFactory. Further Reading, Viewing and References. (1) Gilbert, Alex. A Guide to New York Design Destinations, Artsy. https://artsy.net. (2) Mount, Nick. Designing Craft/Crafting/Design:40 Years of JamFactory. See above in the selection of artist talks. (3) Barkley, Glenn. So Hot Right Now? Contemporary Ceramics and Contemporary Art. Art and Australia (51.4). (4) Were, John. It’s an International Thing, Catalogue, Designing Craft/Crafting Design: 40 Years of JamFactory: p.48. To view the full selection of Jamfactory’s artist talks and various other filmed media, navigate to their YouTube channel. Image: Peta Kruger, Designing Craft/Crafting Design: 40 years of JamFactory, Gold Coast City Gallery. Image: Clare Belfrage. Vibrant contemporary craftsmanship will feature alongside traditional design…view PDF.